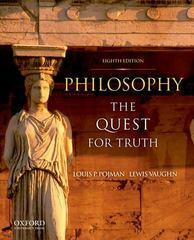 Philosophy 8 Edition Praised for its unique combination of accessibility and comprehensiveness, Philosophy: The Quest for Truth is one of the best-selling textbooks for the introduction to philosophy course. Now in its eighth edition, this acclaimed text provides an excellent selection of eighty-nine classical and contemporary readings on nineteen key problems in philosophy. Coeditors Louis P. Pojman and Lewis Vaughn have carefully organized the essays so that they present pro/con dialogues that allow students to compare and contrast the philosophers' positions. Topics covered include the nature of philosophy, logic, the existence of God, immortality, knowledge, the mind-body question, personal identity, free will and determinism, ethics, political philosophy, the meaning of life, abortion, capital punishment, global ethics, and animal rights. Each of the eighty-nine readings is accompanied by study questions, end-of-reading reflective questions, and an individual introduction featuring a biographical sketch of the philosopher. A detailed glossary of key terms and an appendix on reading and writing philosophy papers--both revised and updated in this edition--further enhance the text's pedagogical value. In addition, each major section opens with a substantial introduction and ends with a short bibliography.NEW TO THIS EDITION:* Eleven new selections from Plato, David Hume, Wesley C. Salmon, Ned Block, Buddhist scripture, Peter van Inwagen, Louis P. Pojman, Virginia Held, Julian Baggini, Peter Singer, and Garrett Hardin* Two new sections: "Induction" in Part III: Knowledge and "Do We Have Obligations to the Poor and Hungry?" in Part IX: Contemporary Moral Problems* An expanded "A Little Bit of Logic" section that offers students more help in identifying and evaluating arguments* Boldfaced key terms, listed at the end of most parts and collected and defined in the fully revised glossary* A revised and expanded appendix on "How to Read and Write Philosophy Papers"* A Time Line highlighting the philosophers included in the textAn Instructor's Manual and Test Bank on CD includes sample syllabi, selection summaries, a list of key terms with definitions, helpful web links, and multiple-choice, true/false, and essay questions on each reading. A Companion Website at www.oup.com/us/pojman contains the material from the Instructor's Manual along with student resources including essay questions, interactive quizzes, flashcards, and additional web links.